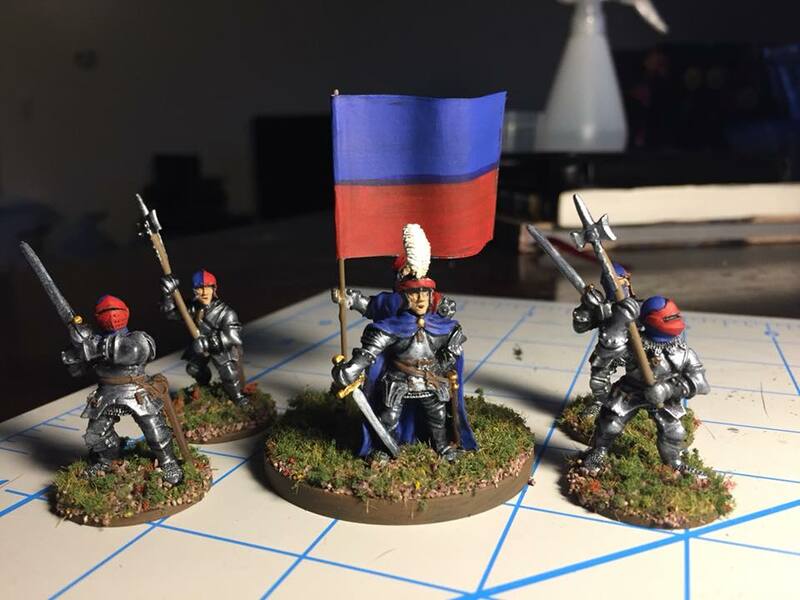 The first unit for my Dragon Rampant "Men of Albion" warband is complete - Lord Edward and his bodyguards, comprising a unit of Elite Foot. 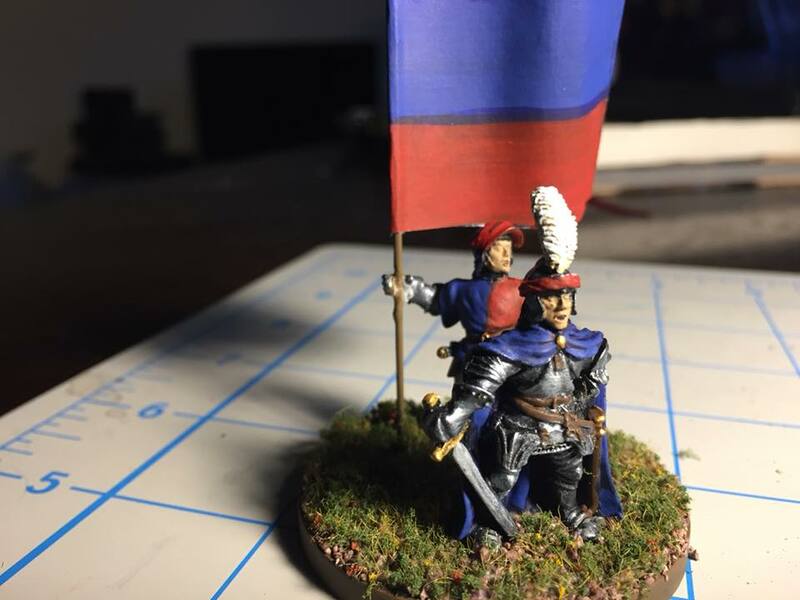 Lord Edward himself shares a base with his standard bearer, and counts as two Strength Points in DR; his four men-at-arms are each a single Strength Point for the unit total of 6 SP. 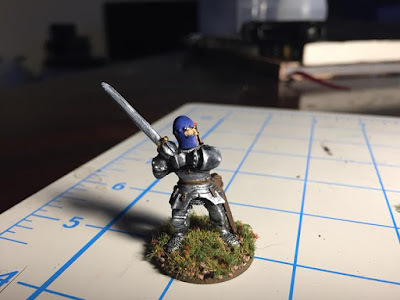 The figures are from Front Rank's War of the Roses line, and I recommend them highly; the figures arrived very neatly and securely packed, and had only the most minimal of flash to trim away. The sculpts are good (though I admit I did basically buy two copies of two sculpts - the knights with similar weapons are the same figure with a different helmet) and the standard bearer came with the choice of a standard pole or a poleaxe. 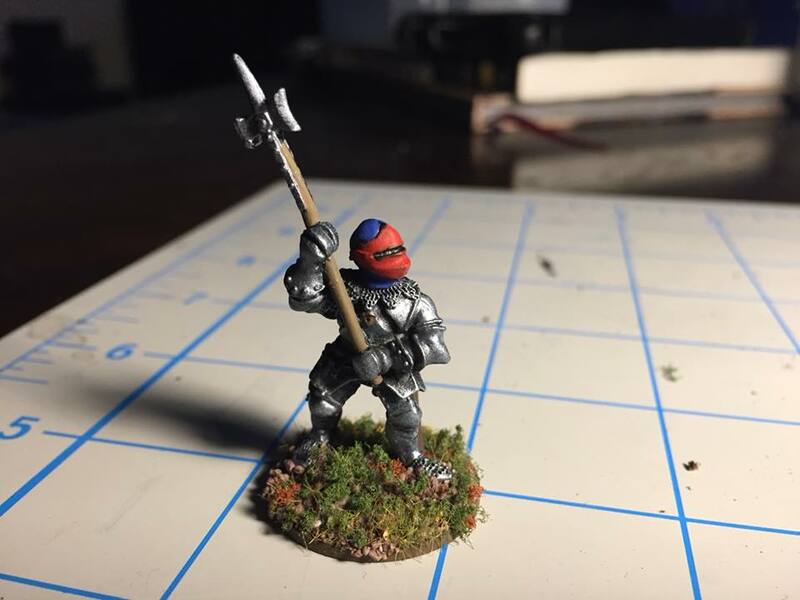 I liked the idea of a command base with the army leader and a standard bearer on it, so that's what I went with here. Since the men-at-arms weren't wearing much cloth to carry the warband's color scheme of red and blue on to, I opted to paint their helmets as having been painted or lacquered before going into combat. The men in the open-faced barbute helmets have their helmets split in half color-wise, with blue on the right side and red on the left. 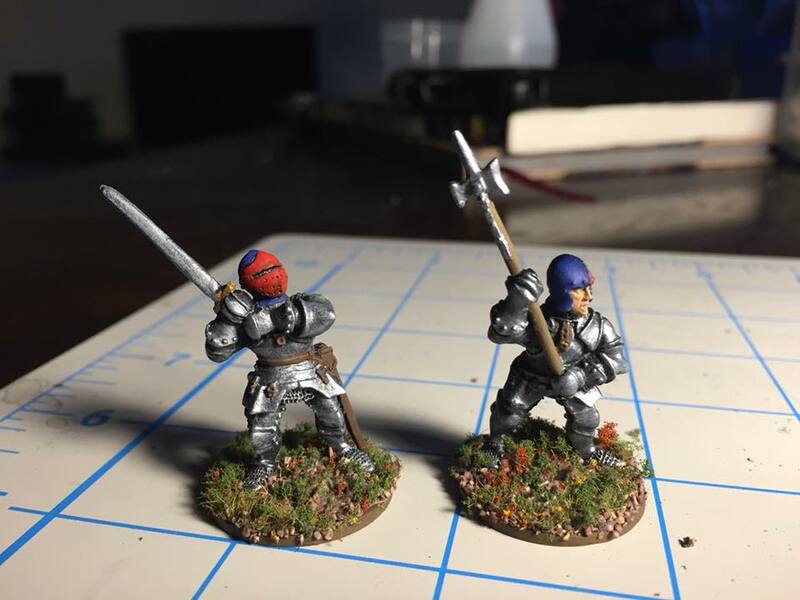 The two knights wearing closed visors had their helmets painted blue with red visors. This was my first time making a paper flag from scratch, and I think I did alright; I drew it out on a piece of graph paper to get it nicely square and then painted over it in the army colors of Reaper Deep Red/Blood Red and Ultramarine Shadow/Ultramarine. Once it was dry I cut it out, painted some white glue on to it and wrapped it carefully around the flag pole, bending it a little to give it a sense of fluttering. very lightly drybrush Reaper "True Silver"
basecoat either Reaper "Deep Red" or "Ultramarine Shadow"
highlight either Reaper "Blood Red" or "Ultramarine," respectively. picked out in Reaper "Dark Flesh." Bases are painted Reaper "Earth Brown" and flocked first with Army Painter brand brown basing grit, followed by GF9 "Meadow Flock." I didn't finish them early enough to get them varnished today but I'll have them out in the primer/varnish box tomorrow. Next I'll be splitting my time between the giant and the unit of billmen and then finally take care of the archers. That's a good looking bunch, love the basing too.